With the well-deserved emphasis on Leave No Trace finally becoming fairly main-stream, alternatives to the good old campfire have become Big Business. Rather than burning up all the natural vegetation in a highly used area or in a pristine wilderness area, many campers and backpackers are choosing to make less of an impact by curtailing their voracious appetite for fire. It is amazing to see the diverse products now available to replace cooking fires - and if you are doing without a campfire, that really is the main requirement needed. By properly fueling and insulating your body, you do not need an external fire for warmth. So, alternatives to campfires are really stoves for preparing food. This is a picture of an Optimus Climber SVEA 123 just like mine that I've had for over 20 years. It has been through Europe and all over the Rocky Mountain states and has served me well. Besides, I think it really looks cool! There are many stoves from which to choose, all with specific Pros and Cons, from types of fuel used, to weight, to cooking speed. So, I hope this page helps you in choosing your backpacking stove and helps us all in protecting the wild we enjoy. For each type of stove, there is a chart with a grade for the more important features. Liquid fuel stoves can either connect to a fuel bottle or have an integrated fuel reservoir. Shown are two samples, one of each. Of course, the integrated one weighs more, but I like it because that's all you need for a short trip and you can keep your fuel supply separate from the cooking. Liquid fuel stoves are manually pressurized by pumping and then they vaporize the fuel through self-heating once they are burning. This is the hardest part about using them. They have tremendous heat output and operate well in any weather. The liquid fuel used is much less expensive than canisters or alcohol, so the more you use the stove, the more you save. You also buy large cans of fuel and have reusable fuel bottles so there is no garbage generated. Some models can burn multiple kinds of fuel. 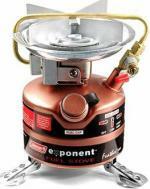 Spilled fuel is the biggest danger with these stoves. It's important to do any reservoir filling or attaching of fuel bottles far away from the cooking area. Also, keep extra fuel far away. Compressed gas canisters don't spill and provide a clean-burning, hot fire with no priming or pumping. These are a good choice if you will only be camping in above freezing temperatures and don't mind throwing away empty metal canisters every time you camp. 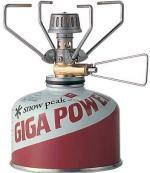 Propane works down to about 0 degrees fahrenheit, but butane should only be used above 32 degrees. Make sure you stock up on canisters because they may be hard to find, depending on your location. And, not all canisters fit all stoves - be sure to get the right kind. Extremely simple stoves that can be made at home from pop cans. They are fun to experiment with and popular with ultra-light backpackers. There are also production stoves that seem to cost quite a bit for what they are. Since there's nothing to them, the stoves weigh nearly nothing. The real weight is in the fuel required, but since they are not pressurized and have an inefficient flame, they consume a lot of fuel. On longer trips, the weight of extra fuel can offset the gain of a fly-weight stove. The stoves burn silently and almost invisibly with no odor so they are nice to have in the wild. The heat output is not that great so it will take longer to boil your water. And, boiling water is pretty much all they should be used for since they are so small. You need to fill the stove with the amount of fuel you want to burn and then burn it. Any extra needs to be burned off or it will spill. You may waste fuel in priming the stove for lighting. Fuel spills can be very dangerous and the invisible flame may tempt people to feel for heat and get burned. Nothing simpler than putting a tablet under your pot and lighting it. Solid fuel stoves are really just a pot holder to keep your kettle a bit above the fuel tablet. These stoves are useful for simple cooking - just boiling water, nothing more. The best thing about these is the solid fuel. They are hexamine or something similar. Nothing to spill, nothing to pour, no special fuel bottles. Just put a bunch of fuel cubes in a plastic baggy and you're ready to go. Of course, its not all perfect. There is definitely an odor from the fuel. And, it creates a sticky brown residue on pots that can be washed off. Also, the fuel is very expensive and you'll probably need to buy it on the Internet since its not often stocked locally. These are a good choice for ultra-light backpackers looking for a single person solution. ongoing cost $.50/pint boiled - ouch! This is simply a campfire in a can. By having a chimney in which to burn small sticks, you create a smaller, hotter fire with more of the heat going to work to cook your meal. Using a wood-burning backpacking stove reduces the amount of fuel you consume and lowers the fire danger since you've got a smaller, contained fire. But, chances are good that you won't be able to use this stove anyplace where campfires are prohibited, such as high wilderness areas. I really can't see the value in having one of these stoves. If I'm going to have a fire, I'd prefer a campfire. But, they do improve efficiency, act as a pot holder, and use awfully inexpensive fuel. ongoing cost $.00/pint boiled - wood's free!